Vision Mobile’s latest State of the Developer Nation paints a grim picture for female developers, with less than 10% of developers in the survey were women. So are mobile app developers like what Silicon Valley has often been criticized for? A frat like club for boys, mostly fresh out of college, that seem to want to hold on to that frat experience waaay too long into their professional careers? What is the problem in that you may ask? 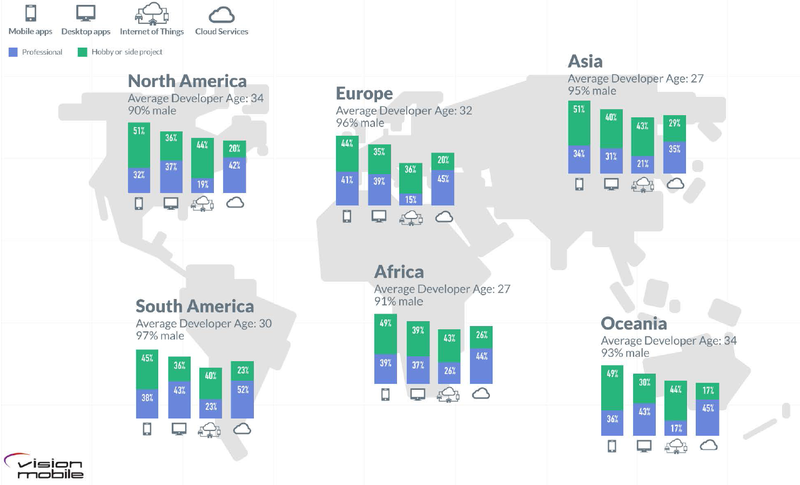 Based on the Vision Mobile data, the gender bias is actually worse as you get outside the US. If you are a female in Latin America for instance, you are almost guaranteed not to be a developer. What does that mean for a business, or for the tech industry as a whole? The main problem is obvious: When you effectively exclude/freeze out 50% of the working population, you miss out on key talent to grow your business and you ensure salaries are artificially inflated due to lack of supply of software engineers. That is a lose-lose situation. Fixing the problem is easier said than done. First, there are clearly more male graduates in computer science, so from the pool of developers to pick from, the choice is slimmer. But that’s not the whole story. It can explain a lower percentage, but nearly NO representation as the Vision Mobile study shows there has to be a different reason, as at least 25% of graduates with a computer science degree are female. Once in the workplace, gender biases feed of each other, making it even more difficult for women to rise through the ranks and get treated and paid fairly, and only defined action plans can help this. It is naïve to think that an industry will solve this by itself, but of course therein lies the opportunity for companies who recognize the importance of bringing on talented female engineers as a competitive advantage. They need to understand that the ‘brogramming’ culture needs to be changed (no, not everyone loves foosball, beer pong on Fridays, and playing basketball at lunch – not even among guys) and they need to ensure equality, fairness and flexibility should be the cornerstones of the company culture.